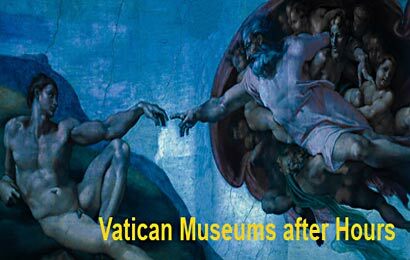 WHY GO View Vatican Museums and the Sistine Chapel after Vatican closes to general public. Limited number of guests. Tickets with timed admissions. the Sistine Chapel with Michelangello's Ceiling and the Last Judgement, Vatican Library. All in company of friendly Vatican licensed guide explained to you in your native language, as you walk through half empty Vatican. PARTICIPANTS MEETING PLACE: Outside entrance to Vatican Museums (Viale Vaticano 102) Guide will have sign VATICAN VISIT with your name.